The December meeting of the HPMS was called to order at 7:10 P.M. on 3 December. There were 9 attendees. The minutes of the November 2018 meeting were read and approved. The existing slate of chapter officers will continue to operate the chapter. This was the decision and was approved by the members present at this meeting. The certification of the chapter officers will be forwarded to IPMS National with the renewal of the chapter charter. There was continuing discussion regarding the 2019 show and contest. Tom Clark will continue to look into the matter of new banners for the chapter. The matter of sales tax collection from the vendors was also discussed. Tom Clark and Dave Lanteigne have made some inquires to functions that deal with this and much of it appears to be a definite "maybe". So far state and city offices have responded. The end results have been the state implies that the vendors are responsible for collecting sales tax, but 'estate' sales are not. The city implies that the chapter is responsible and liable for any sales tax not collected. Along with this was the mention of the chapter providing the city of vendors prior to the show. Based on the response that was generated by the state differentiation of vendor category was discussed. The final decision was that further research would conducted by our chapter treasurer. A note here, a couple of our chapter members that were at the Murfreesboro show and contest talked with vendors at that show, and yes there are sales tax collection concerns on the part of some vendors. The subject of special theme category for our 2019 show and contest was brought to the floor. A basic flyer for our show was taken to Murfreesboro and distributed. The chapter stills needs to produce a fee structure. During the course of this discussion there was mention of using the fee structure as used in the 2018 show and contest. Sales tax: We decided to do the same thing we have always done which is to distribute envelopes to the vendors and let them decide how they want to “pay their taxes”. If we get kickback from the city (which was the major concern here) we will give them a list of the vendors that bought tables at the show and let them chase after them. Vendors will be informed of this as we hand them the envelopes. 2019 Show: We will have a special award as follows: “In celebration of the 50th anniversary of the first moon landing, we will have a special award for anything DIRECTLY related to the US Space program”. This will be an “all inclusive” award which means it could go to anything in any discipline as we have discussed ad infinitum at previous meetings. We will need to be vigilant when judging individual categories to keep an eye out for entries which have been designated by the entrant as eligible for this award! We can use a Gold Star sticker on the entry form (to distinguish from the red, yellow, blue stickers for 1st, 2nd, 3rd after judging). Our chapter has had a good year and the matter of donations to other functions was discussed. 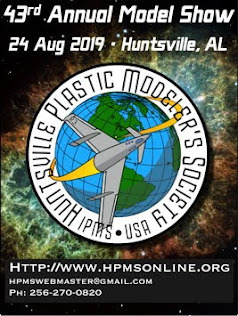 Among the suggestions was donations to established charities, sponsor trophy packages at other IPMS chapter shows, trophy packages for future IPMS national shows, and new banners for our chapter. Chapter dinner: The Chapter Holiday Dinner will once again be at El Coyote Mexican Restaurant on Old Madison Pike. This will be held on January 11, NOT the 4th. Even though the January meeting is non-business (Annual Swap Meet), at least there will be a gathering BEFORE the diner to help serve as a reminder to attendees. Movie night: December 17 in the monthly build night. Tom proposed going to the see the movie “They Shall Not Grow Old” in lieu of Build Night. Tom basically said he is going to the movie at the Monaco. Y’all can do what you want. There was also mention that the movie was already 75% sold out, so you better get your tickets while you can. Reserved seating also means late purchasers might be sitting in the front row barely able to enjoy the full effect (3D). Congratulations to Bruce O'Gorman, at the Murfreesboro show he captured second place in the Science Fiction category with a Pegasus 1/72nd scale "Apollo 27" rocket done up as an early Klingon space craft. He also captured third place in the "Rusted and Busted" category with his mini diorama of a long forgotten vehicle. ﻿MARRY CHRISTMAS AND ﻿HAPPY NEW YEAR TO ALL!!!! !